What Property Can You Afford To Buy In Australia In 2018? The recent fall in Australian property prices is good news if you’re looking to buy your first property in Australia. Moving to Australia is the dream of many UK residents with the weather and relaxed way of life usually being a huge factor. However, another important part of the Aussie dream for many people is having a spacious house with a swimming pool. Having the ability to own your own pool as well as a property far larger than that of UK properties is a huge bonus! Australian homes are generally well known for being more spacious than in the UK. Choosing the right property in the right area is vital for getting your move down under off to a great start. With such a drop in housing prices it would be ludicrous to not take the opportunity to move to such a beautiful and cultural country! The average price of property in Australia has fallen from its peak which means there is so much more value to be had for the buyer. This could be a home that sets you up for life! The national medium is currently around A$550k (£305,000), somewhat higher than the UK average of £231,422 (A$418,000) in July 2018. The latest figures (30th September 2018) show that national property prices have dropped every month since their peak in September 2017. Overall, property prices have dropped 2.7% over the last year – but this is mainly in overpriced Melbourne (-3.4%) and Sydney (-6.1%). Other cities continued to see prices increase: Adelaide and Brisbane have gone up by just under 1%, Canberra 2% and Hobart 9.3%. 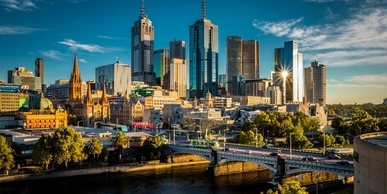 Although a few speculate there might be a property market crash around the corner, most experts predict prices to decrease in some of the major state capitals in 2019 and growth to slow elsewhere. Taking the leap and making your move to Aus could be a risk, but knowing you can gain such a beautiful property with the likely hood of it costing you far less than an average property in the UK, you should definitely make a move. There is no denying that property prices change depending on city, but many of these properties are far cheaper than those in the UK, with so many extra benefits as well. So what property can you afford in Australia? Check out The PSS Australian Property Guide for UK Buyers!